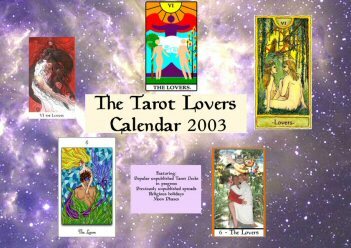 The 2003 edition featured: The Masque Tarot, 21st Century Tarot, The Mary-el Tarot, Supletion's Tarot, Major Tom's Tarot, Kayne's Celtic Tarot, and The International Icon Tarot. There were about 60 copies printed. 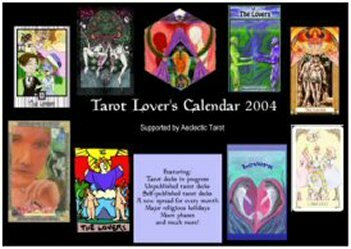 The 2004 edition featured: The Tarot of Prague, The Ator Tarot, The Ferret Tarot, The Vanessa Tarot, The Amun Re Tarot, BoomVoom's Tarot, The Geometric Tarot, The Ator Tarot, The World Tree Tarot, The Police Tarot, and the Second Aeclectic Community Tarots. There were 100 copies printed. 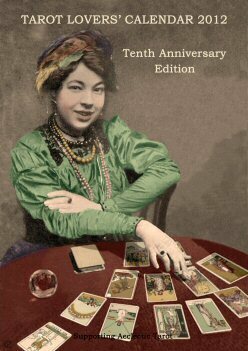 The 2005 edition featured: Chat du Marseille, Tarot of the Lepidopteran People, Baroque Bohemian Cats’ Tarot, Sakki-Sakki Tarot, Simple Tarot, Feral Tarot, Spirit Vision Tarot, Dolphin-Daze Tarot, Pet Tarot, Tarot of the Midnight Masquerade, Cat’s Eye Tarot, and Major Tom’s Tarot of Marseilles. There were 300 copies printed. 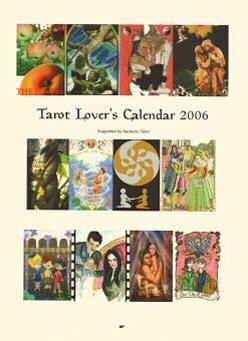 The 2006 edition featured: The Minute Tarot, The Creative Fire Tarot, The Mandala Tarot, Les Adorables Tarot, The Garden Path Tarot, The Angel Tarot, Tarot of Dreams, The Butler Tarot, The Fairytale Tarot, The Monster Movie Tarot, Sol Invictus - The God Tarot, and The Food Inspiration Tarot. There were 300 copies printed. 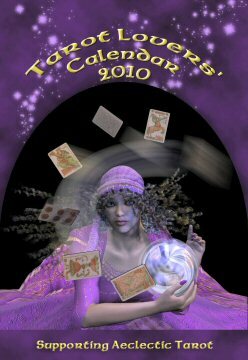 2007 was the first year I held a contest to design the cover of the calendar. This cover design is by Chris Butler. Decks featured in this edition: The Kingdom Highway Tarot, The Seneris Tarot, The de Geri Tarot, The 3rd Aeclectic Community Tarot, The Windrow Tarot, The Quantum Tarot, The Tarot of the Sidhe, Cauldron of the Kitchen Witch Tarot, The 4th Aeclectic Community Tarot, The Temperlyne Tarot, The Son Tarot and the Mythos Tarot. There were 100 copies printed. Jean-Michel David designed the cover for the 2008 calendar. Decks featured in this edition include: The Creator's Path Tarot, Diary of a Broken Soul, The Lurianic Tarot: Voice of AR'I, The Doodler Tarot, The Wooden Pirate Tarot, The Greylight Tarot, Tarot of the Black Mountain, The Little Window Tarot, Tarot of the Achromatic Impressions, MassKara Tarot, Maundy Thursday Tarot, Tarot Whispers in the House of Dusk, All Hallows Tarot, The Phantomwise Tarot, and The Spoonbender Tarot. There were 150 copies printed. The cover of the 2009 edition is by Kris Waldherr. The decks featured in this edition are: Lillie's Frog Tarot, The Touchstone Tarot, The Bifrost Tarot, The Transparent Tarot, Tarot Guerreros de la Luz, Restoration of the Tarot of Marseilles of Jean Payen, The Gay Contemporary Tarot, The Wanabe Tarot, The Pizazz Tarot, Le Millenaire Tarot de Marseilles, Tarot Bella, and the Celestial Stick People Tarot. There were 100 copies printed. The cover of the 2010 edition is by Gail Kettleson. The decks featured in this edition are: Tarot of Trees Pistis Sophia - The Goddess Tarot, El Tarot de Marcelino, The A. Nonny Mouse Tarot, The Song Bird Tarot, The Mystereum Tarot, Restoration of the Tarot of Marseilles of Jean Dodal, The Otherworld Tarot, The Un-Named Tarot, The Richard Pickman Tarot and Tarot Heramentado. There were 100 copies printed. The cover of the 2011 edition is by Gail Kettleson. That's right Gail won the contest two years running. 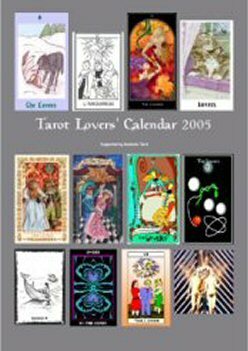 Decks featured in this edition are: Tarot Americana, The Desi Tarot, Tarot Noir, The Sarah Magdalene Tarot, The Lazy Afternoon Tarot, Tarot of the Curious East, The Tarot of Life, A King's Journey Tarot, Monochromatic Fantasy Tarot, Tarot of the Golden Serpent, and The Vulpine Tarot. There were 100 copies printed. The cover of the 2012 edition is by Penelope Cline and is by far the most popular cover. Poor Penny is stretched to the limit trying to defend her copyright of it. 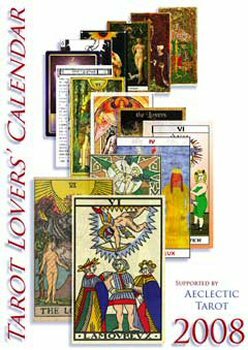 Decks featured in this edition are: Victorian Trading Card Tarot, Triomphes de Paris, Animalis Arcanum, Tarot Stones, The Incidental Tarot, Diary of a Starseed Rebellion, Raven's Fool Tarot, The Wild Green Chagallian Tarot, The Simply Deep Tarot The Ecliptic Tarot, The Rosetta Tarot and the Sickly Tarot. There were 100 copies printed. The cover of the 2013 edition is by Pamela Steele. Decks featured in this edition are: Pearls of Wisdom Tarot, Tarot of the Boroughs, The Cook's Taro, Medieval Chihuahua Tarot, The Chalice Tarot, Le Tarot des Femmes Erotiques, The Wizard's Pets Tarot, The Tarot of the Sevenfold Mystery, iTongo Tarot for Transformation, The Parallel Worlds Tarot, Tarot D: The Didactic Tarot, and Tarot of the Red Jester. This was the first edition produced and printed in the USA. There were 100 copies printed. The cover of the 2014 edition is by Jill Scott. 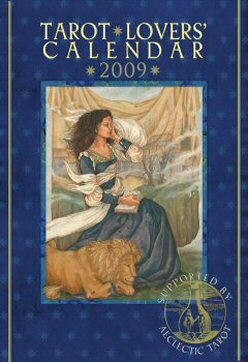 Decks featured in this edition are: Gypsy Palace Tarot, Journey Into Egypt, Peaceful Path Tarot, Cross Stitch Tarot, Tarot de Marseille de Seilonen, Between Worlds Tarot, Quel Tarot, Tarot de Marsella Robledo, Tarot of Squeelandia, Stolen Child Tarot, The Contract Tarot and the Holy Card Tarot. There were 100 copies printed. The cover of the 2015 edition is by Astrid Amadori. 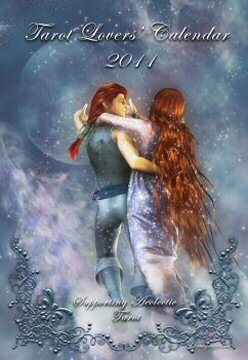 Decks featured in this edition are: Astral Scion Tarot, The Ellis decK, Irish Lenormand, Tabula Mundi Tarot, The Syzygy Oracle, Tarot de St Croix, Katrina's Personal Petite Lenormand, The Compound Tarot, The Dark Carnival Tarot, Lux Ferous Tarot The Singing Serpent Tarot, and The FaYth Tarot. Of the 500 copies printed most were pulped. Only 55 remain making this the rarest edition. 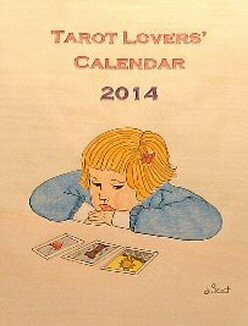 For me, the Tarot Lovers' Calendars were a labor of love, a way for me to recognize and encourage independent tarot deck creation. 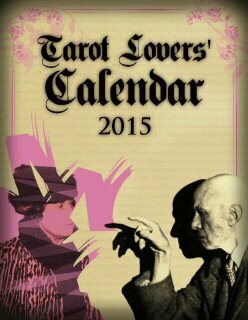 As you review the lists of tarot decks featured in the various editions you will find many of your favorites. 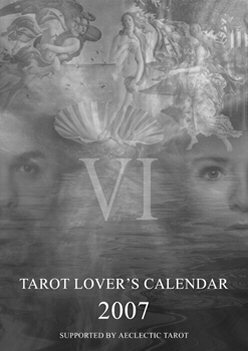 My vision for the caIendar was to produce an annual, high quality, limited edition showcase for the best tarot decks produced by independent artists. I'm proud of what I accomplished but now wish to put that same energy into my own creative endeavors. Pictured here are the covers of the 13 calendars produced. I'm certain all the editions are valued possessions of those who were lucky enough to buy them either as they were produced or picked up second hand from a collector. I do have a few of some of the editions. Some of the editions sold out. If there's a gap in your collection you'd like to fill you can always drop me a line. You might get lucky and I'll have what you want for the cover price.